George Frederick Bodley is normally considered to be the leading church architect of the latter part of the nineteenth century and an important designer of domestic buildings also. He is of particular interest to us because be had many connections with Herefordshire, including the area around Ross. He was born in 1827, the son of a doctor who claimed descent from the Sir Thomas Bodley who founded the Bodleian Library in Oxford in the 16th century. He was a pupil of George Gilbert Scott from 1845-50, and thereafter practised as an architect right up to the time of his death in 1907. The importance of his long career is that he was one of the prime movers in taking forward architectural style from the heaviness and intricacy of the High Victorian period to the simpler and lighter forms of the century. His churches became more lofty and spacious, and were in a simpler direct style, which relied on the subtleties of massing and the use of appropriate materials, rather than heavy ornamentation. He was also an associate of William Morris and was the first to use his stained glass in one of his churches. In his domestic work he was one of the earliest users of the "Queen Anne" style which became prevalent in the last quarter of the 19th century, and which features the use of red brick, sash windows, weatherboarding, etc. in contrast to the stone, gothic buildings which came before. In Herefordshire he built three churches of which more later, and was involved in restoring at least seven others, Brampton Abbots, Kingsland, Wigmore, Lyonshall, Kinnersley, Almeley and Burrington. The earliest of these was our local example at Brampton Abbots done in 1857. This includes a boarded "wagon roof" (i.e. a ceiling with a semi-circular profile) in the chancel, the first example in his work of this feature, which he was to employ frequently thereafter. He also designed the charming school building next door. His most important restoration work, and that which meant most to him, is at Kinnersley, 15 miles N.W. of Hereford. This is because in 1872 he married Minna Reaveley, daughter of the family who at that time owned Kinnersley Castle, a large house mainly dating from the 16th century and now open to the public on certain days in the summer. He decorated and improved Kinnersley church over a period of some 30 years, including painted designs on the roof, walls, chancel arch and organ case and stained glass for the west window. He also designed the Reaveley family gravestones in the churchyard and, although he never lived in Herefordshire, his own body was also laid to rest there. Of his domestic work in the county he built a parsonage at Burrington, near the Shropshire border, in 1862. This is in a fairly traditional gothic style, and the contrast with the point he had reached by 1868 can be seen by travelling to Malvern Link, where in that year he built four retreat houses for clergy from London in Ranelagh Road, which have many of the characteristics of the "Queen Anne" style. A more substantial commission was to build a new wing in an Elizabethan style at Michaelchurch Court (in Michaelchurch Escley, not the one near Harewood End) for Charles Guy Trafford in 1867. This was subsequently demolished except for its facade which remains as a very grand garden feature. Turning to his three new churches in the county, the first was designed in 1854 when he was only 27 and is at Llangrove, 5 miles south-west of Ross. The church is unfussy and unpretentious and the interior has a cool elegance. The most radical feature for its date is the arcade dividing the nave from the south aisle where the rectangular columns have no decoration except for chamfering at the edges and run straight up into the arches above with no capitals of any kind. This arrangement has no medieval precedent and its simplicity has a very modern feel. 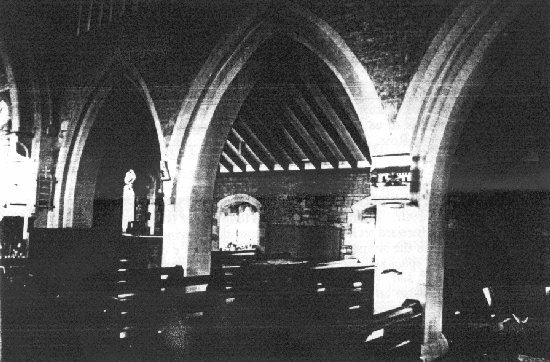 Bodley went on to rebuild Canon Frome church, except for the 17th century tower, in 1860. This is a bit more traditionally Victorian in feel but has some of the same clean lines inside. Forty five years later, when he was 78, he designed the chapel at Horn Green in Walford parish. This was a commission from the Trafford family, for whom he had built the new wing at Michaelchurch Court, and who had since acquired the Hill Court estate. The chapel was built in memory of Major Lionel James Trafford and was dedicated to the Paraclete (a name for the Holy Spirit as advocate or counsellor). Once more the church, although small, feels airy and spacious. It has a simple, boarded wagon roof along its full length and one of Bodley's tall, elegant arcades. The unusual feature of the latter is that, instead of demarcating a side aisle, it runs down the middle of the church from front to back. After becoming unused and derelict, the church has successfully been refurbished by Rehau Ltd. as a conference hall and occasional venue for recitals. Herefordshire, where Bodley is buried, thus has many pieces of his work, and we in Ross are fortunate that we have good examples nearby of churches from very early, and very late, in the career of this interesting architect. G.F. Bodley - Climax of the Gothic Revival by David Verey in "Seven Victorian Architects". The Blue Guide to Churches and Chapels (Herefordshire section by Adrian Barlow and Keith Kissack). Herefordshire Churches and their Treasures by John Leonard.